Oh, my goodness, Nancy! I am so sorry to hear this! Is there anything that we can do from afar? I wish I could come up to NJ to be of help on the spot, but, unfortunately, I can’t just now. Maybe a phone call? Would that be good? How is the pain? And however did you manage to type this incredibly well-written blog post with one hand? You for sure have grit and determination if you pursued one-handed contact lens insertion! I am sure that I would have despaired and settled for my glasses for the duration. You are amazing! I will give you a call tomorrow. Andrea, thank you so much for your kind words. I’m doing sooo much better. The good news is I broke my right wrist and I’m a lefty! Talk tomorrow. Love this post, love your writing, love the still life–and love that you’re healing! Thank you my beloved Sharon–the Sharon of my story. Thank you for the backcountry rescue, the wardrobe change, the student driving test, the advocacy, the home healthcare, the love, and as always, your expert editing! Such an excellent read Nancy!! Even though I’ve heard the tale, it still makes me cringe to think about what you’ve gone through. Here’s to your GRIT and Sharon’s friendship. Thank you Melissa! Thanks for your friendship and deep care and concern. And listening to the tale as I talked it through–before I hunt and pecked! Good luck Nancy with your recovery.. know the feeling you have..Right now I am in my third week of recovery from a slip onto concrete and multiple fractures around my right elbow.. So like you no tango or walking..
Than you Bill! With our uninjured left arms, perhaps we could cobble together some sort of a tango embrace :). I wish you the best with your recovery. 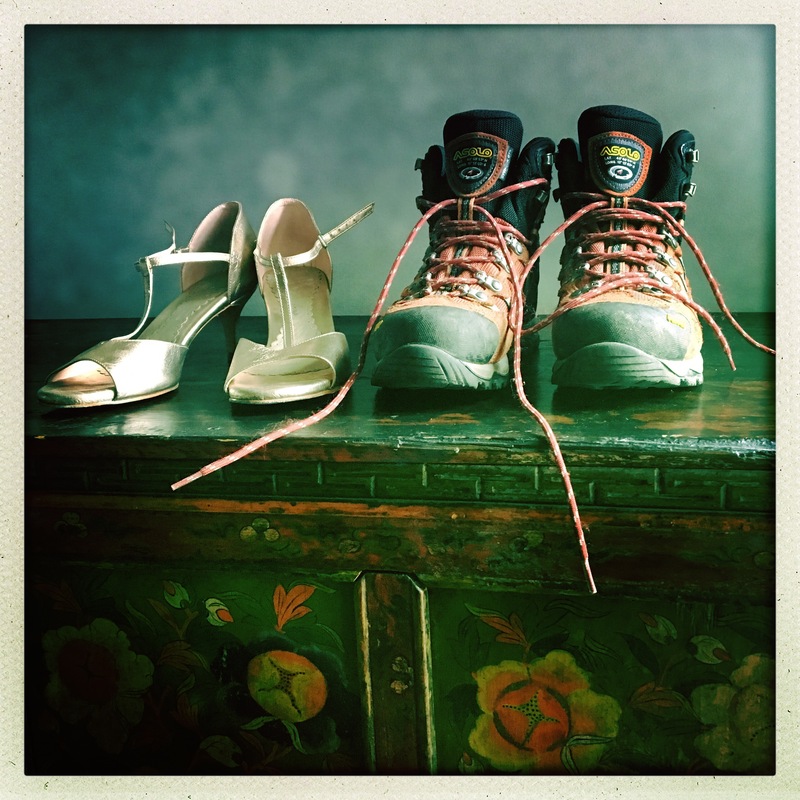 When we trekked around Manaslu together, I knew you were intrepid and hardy, and now I know you’re indomitable–in addition to being a sharp writer (and photographer; the tango shoes and boots picture is lovely and expressive). You’ll be back on the dance floor and the rocky trails soon, I trust. Tom, that was my favorite trek. I remember the stunning balcony trail, and a porter load–sans porter–that dropped 1000 feet down a mountainside. And the night the porters overshot the camp and we didn’t rejoin the group until the next day. And the water froze that night. Good times. Thanks for reading and appreciating. Nancy you are a brave adventurer and a wonderful writer. So heal rest and contemplate your next chapter the summer awaits. Thank you Lily! We will resume our tour of Hoboken walks very soon.